A list of some of the easy methods available for typing in Indian languages like Hindi, Marathi, Bangla, Tamil and other Indian languages. These tools use phonetic keyboard layout and that makes them very easy to be used by a common user on computer and internet. During last 10 years, the number of people wanting to learn Hindi typing on computers has been increasing steadily and in last couple of years, the number has indeed sky-rocketed. As I am the founder and administrator of one of the most popular Hindi websites –a lot of people ask me questions on how to type in Hindi on computer. I began typing in Hindi Unicode sometimes in 2003, I guess. I never learnt typing in Hindi language. But in last one decade, I have written two books in Hindi, I have been blogging in Hindi and I launched to two big Hindi websites; all without ever learning professional Hindi typing on computer. Well, technology has made it quite easy to type in Hindi on computer –even for the non-typist people like me! Since long, most Hindi speakers have been typing Hindi on computers in “Romanized” way, i.e. transliterated Hindi using English keyboard. For example, to say “How to type in Hindi” people would write “Hindi mein kaise type karein“. But now Hindi users want to learn and type right in Devanagari script, for example, “हिन्दी में कैसे टाइप करें”. For such people now several PHONETIC keyboard layouts are available. Users who have professionally learned typing –for them Remington and In-script keyboards are also available. What is a Phonetic Keyboard? You may be wondering “what the heck is a phonetic keyboard?” and why is it important to know about it? Well lets learn the answers! In the present context, keyboard is a logical scheme and NOT the physical keyboard on which you press keys. This scheme states what should happen when you press a particular key. In English typing scheme, when you press the key “R”; the letter “R” appears on your screen. But we can change this scheme and make something else appear on screen when the key “R” is pressed. 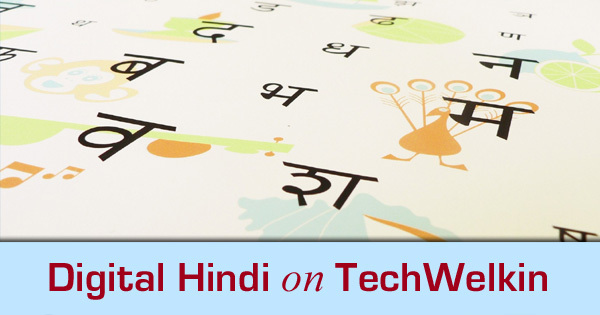 TechWelkin also publishes useful information about using Hindi on digital devices and Internet. For example, scheme might be set to print “र” on screen when “R” is pressed. In phonetic schemes, typing is done like R for र, B for ब, S for स. And therefore, bhaarat for भारत. In other types of keyboard layout you might need to press keys which don’t sound like the Hindi alphabets that you want to print on screen. For example, while using the popular Krutidev font, you need to press Hkkjr keys to print भारत on screen. This is because Krutidev (and several other fonts like Chanakya, Susha, Arjun, Devlis etc.) do not follow the phonetic keyboard layouts. As you might have understood by now, for lay people, typing in phonetic layout is much easier. There are a number of PHONETIC methods for typing in Hindi. Lets have a look at some of these methods. Click on the above link to open this great tool from TechWelkin. This Hindi typing tool is based on Google Transliteration. We have added a few more facilities. For example, you can save the text you type in an MS-Word document. Also there is facility of correcting common mistakes in Hindi typing. Available online. No need to install any software. Phonetic (i.e. type bhaarat for printing भारत on screen). Easy to use and type. You can save typed text in MS Word document. Popular email service Gmail has an integrated Hindi typing tool. In Gmail, when you compose an email you will see a button with “अ” written on it. If you click that button and type in email -the text will automatically get converted into Hindi when you will press space key. On the General tab, select the checkbox next to ‘Enable Transliteration.’ If you don’t see this option, click the Show all language options link first. Select the language you’d like your messages to be written in from the drop-down menu. Now compose an email and you should find the “अ” button. Online, no need to install any software. Gmail automatically saves what you type. Therefore you don’t lose anything in case of power failure etc. The Google Transliteration tool is also available for offline use (i.e. for use when you are not connected with Internet. I have written a separate tutorial on how to install and use Google IME. You can read it for further details. This is the tool that I use for typing in Hindi. This tool started with great success but slowly lost sheen because of two reasons. One is the launch of Google IME and the second reason being that lately developers of Baraha made it a paid software. So, it is no longer available for free. I have written a tutorial on how to use Baraha. Please note that this tutorial is in Hindi. This is another online utility for Hindi typing. It is quite similar to Google Transliteration but, unlike Google Transliteration, if you want to save the type text, Quillpad allows you to export it. Alright friends, This is it! Let me know how you liked the article and if you’ve any questions in this regard, please feel free to ask me! Thank you for using TechWelkin! Thank you Lalit ji. Can you let me know how to have a paragraph transliterated into Hindi fonts which has been copied and pasted from somewhere. English to Hindi transliteration is not easy because different different people use different styles for writing Hindi using English letters. I have learnt a lot from your articles. In non android environment (for example we use PC), we can compose emails in Hindi by selecting “अ” button in Gmail. However no such button exists while using Gmail in Android environment. To type in Hindi one has to install an app. Is it not possible to type in Hindi in a web page without installing an app by way of incorporating a Java Script in web page? Pleasure is all mine! Stay connected with TechWelkin! sir, i don’t know devnagari typing but i am a good writer in hindi, so i want that my articles should be typed in roman script and it should be shown or print as devnagari, what i have to do for that. Any of the above tool will help you. They all work the same way. You type in roman -and these tools convert text into Devanagari. I would suggest, to begin with, you can try Google Transliteration. क्या आपने इनस्क्रिप्ट कीबोर्ड का प्रयोग किया है? आप तो हिंदी का लम्बा प्रयोग करते हैं… बरहा ने अब तो ट्राइल बंद कर दिया है. Your concern for Rashtrbasha is adorable. I’m otherwise typing poems on google transliteration and preserving them in a file. Thanks for compiling it up. Phonetic keyboard nicely described here. A rich article for novices who are unaware of such tools.